Meropenem bactericidal activity depends on the time when the free drug concentrations remain above the minimum inhibitory concentration of pathogens. The goal of this study was to compare clinical and bacteriological efficacy of continuous meropenem infusion versus bolus administration in critically ill patients with severe infection, and to evaluate the safety of both dosing regimens. Patients admitted to the interdisciplinary Intensive Care Unit (ICU) who suffered from severe infections and received meropenem were randomized either in the Infusion group (n = 120) or in the Bolus group (n = 120). Patients in the Infusion group received a loading dose of 2 g of meropenem followed by a continuous infusion of 4 g of meropenem over 24 hours. Patients in the Bolus group were given 2 g of meropenem over 30 minutes every 8 hours. Clinical and microbiological outcome, safety, meropenem-related length of ICU and hospital stay, meropenem-related length of mechanical ventilation, duration of meropenem treatment, total dose of meropenem, and ICU and in-hospital mortality were assessed. Clinical cure at the end of meropenem therapy was comparable between both groups (83.0% patients in the Infusion vs. 75.0% patients in the Bolus group; P = 0.180). Microbiological success rate was higher in the Infusion group as opposed to the Bolus group (90.6% vs. 78.4%; P = 0.020). Multivariate logistic regression identified continuous administration of meropenem as an independent predictor of microbiological success (OR = 2.977; 95% CI = 1.050 to 8.443; P = 0.040). Meropenem-related ICU stay was shorter in the Infusion group compared to the Bolus group (10 (7 to 14) days vs. 12 (7 to 19) days; P = 0.044) as well as shorter duration of meropenem therapy (7 (6 to 8) days vs. 8 (7 to 10) days; P = 0.035) and lower total dose of meropenem (24 (21 to 32) grams vs. 48 (42 to 60) grams; P < 0.0001). No severe adverse events related to meropenem administration in either group were observed. Continuous infusion of meropenem is safe and, in comparison with higher intermittent dosage, provides equal clinical outcome, generates superior bacteriological efficacy and offers encouraging alternative of antimicrobial therapy in critically ill patients. Severe infections in critically ill patients and increasing antibiotic resistance are major healthcare problems affecting morbidity and mortality in the intensive care unit. Antibacterial drug discovery and development have slowed considerably in recent years. The number of new antibacterial medicines entering the clinic has been declining and, in view of this fact, new compounds for multi-drug resistant Gram-negative bacilli will unlikely be available for more than 10 years [1, 2]. The problems associated with escalating resistance and decreased development of antibiotics with novel mechanisms of action has required more research into existing antibiotics. The effort to maximize antibiotic activity has led in recent years to the interest for optimal dosing based on pharmacodynamic and pharmacokinetic properties of antibiotics . Because of broad spectrum activity against Gram-negative and -positive organisms and low toxicity, meropenem remains a suitable choice for treatment of severe infections in critically ill patients. It is currently established that meropenem, like other β-lactam antibiotics, displays time-dependent bactericidal activity and the percentage of the dosing interval that free drug concentrations remain above the minimum inhibitory concentration of pathogen (%fT > MIC) is the most important parameter for predicting their antibacterial efficacy [4, 5]. As a minimum standard for carbapenems the T > MIC should be maintained at 40%, . However, patients with serious bacterial infections with T > MIC of 100% displayed significantly greater clinical cure (82% vs. 33%; P = 0.002) and bacteriological eradication (97% vs. 44%; P < 0.001) than patients with T > MIC of < 100%, thus maintaining antibiotic concentrations above the MIC for 100% of the dosing interval should be considered [7, 8]. The maximum killing effect of β-lactams is reached at four to five times the MIC with higher concentration not contributing further to increasing the antimicrobial effect. It can be presumed that intermittent infusion recommended by pharmaceutical companies results in high peak concentration and low through concentration and can cause reduced efficacy. Furthermore, pathophysiological changes that occur in seriously ill patients with sepsis often affect volume of distribution, drug clearance and altered pharmacokinetic parameters making these recommendations potentially inappropriate [9–12]. The use of continuous administration of β-lactams was studied in some trials [13–22], but strong evidence of clinical efficacy of this alternative is lacking. 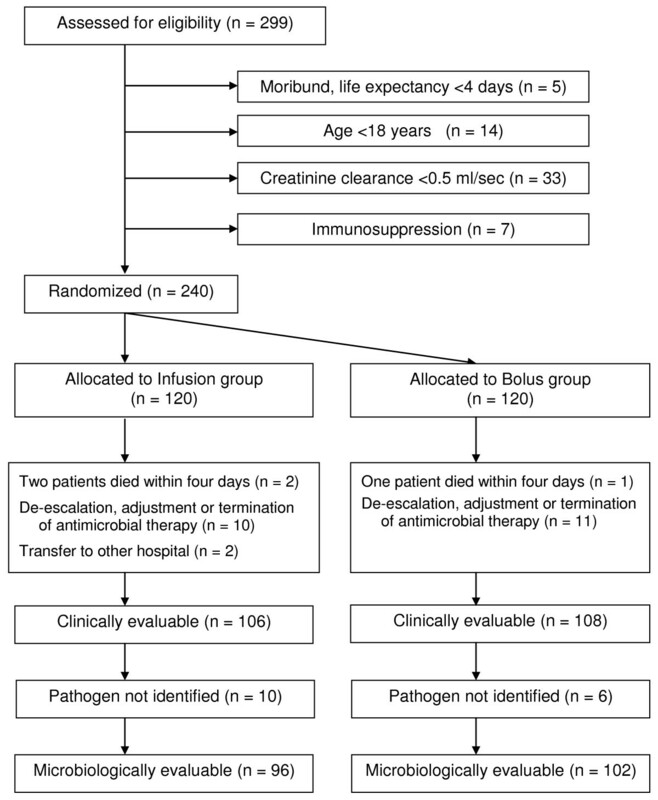 The goal of this study was to compare the clinical and bacteriological efficacy of continuous infusion of meropenem versus traditional bolus administration in critically ill patients with severe infection, and to evaluate the safety of both dosing regimens. This was a single-center, prospective, randomized, open-label comparative study conducted at the interdisciplinary ICU of Department of Anesthesiology and Intensive Care Medicine at Charles University teaching hospital in Plzen. The trial was approved by the local research ethics committee (Ethics Committee of University Hospital in Plzen). Informed consent was not required because the protocol of meropenem administration was considered the standard of the routine clinical practice in this intensive care unit (ICU) and no interventions were made during data collection and analysis. Nevertheless, subjects were informed at discharge that they had participated in this clinical study and subsequent written consent was obtained. All patients admitted to the 11-bed interdisciplinary ICU between September 2007 and May 2010 who suffered, at admission or during the ICU stay, from severe infection and received meropenem with predicted duration of treatment for at least four days were considered for inclusion. All enrolled patients fulfilled the criteria of sepsis . Types of infections included abdominal, respiratory, skin and soft tissue, bloodstream, central nervous system (CNS), urinary tract or other sources of infections. Diagnosis of infection was established in accordance with predefined criteria . Meropenem administration was indicated mostly as second-line antimicrobial therapy based on microbiological findings but also as empirical therapy for sepsis without a proven source and pathogen. Concomitant antimicrobial therapy was allowed. The absolute majority of antimicrobial therapy (meropenem and concomitant) was started according to consultation and stewardship of a university hospital microbiologist. The MIC of meropenem in identified pathogens was determined by using E test (AB BIODISK, Solna, Sweden) methodology. Exclusion criteria included age younger than 18 years, pregnancy, acute or chronic renal failure with glomerular filtration rate lower than 0.5 ml/s, immunodeficiency or immunosuppressant medication, neutropenia (absolute neutrophil count < 1,000 cells/mm3), and hypersensitivity or allergy to meropenem. Glomerular filtration rate (GFR) for all patients was daily calculated by using of the four-variable Modification of Diet in Renal Disease (MDRD) formula . For patients who developed renal impairment (GFR < 0.5 ml/s) during the study, the dosage of meropenem was adjusted according to product labeling . Antibiotic therapy was stopped at improvement of the clinical state and signs of subsidence of infection (body temperature below 38, 3°C for more than 24 hours, white blood cells (WBC) count less than 11,000/mm3 or decrease by 25% of maximal value) [27, 28]. Patients meeting inclusion criteria with no presence of exclusion criteria were randomized using sealed opaque envelopes in one-to-one proportion without stratification to receive either continuous infusion (Infusion group, n = 120) or intermittent intravenous application (Bolus group, n = 120) of open-label meropenem (Meronem; AstraZeneca Pharmaceuticals, Macclesfield, Cheshire, UK). The patients in the Infusion group received a loading dose of 2 g of meropenem in 20 ml of normal saline infused by central line over 30 minutes followed immediately by continuous infusion of 4 g of meropenem over 24 hours. With the respect to stability of meropenem, the infusion was given as four 1 g infusions over six hours in 50 ml of normal saline [29, 30]. The patients in the Bolus group received 2 g of meropenem in 20 ml of normal saline infused by central line over 30 minutes every 8 hours. In both groups, meropenem was administered through separate lumen of central venous catheter using a perfusor (Perfusor® fm (MFC); B. Braun, Melsungen AG, Germany). Patients in both groups were treated during their ICU stay by the regular team of ICU physicians and received standard intensive care. Primary outcome measures were clinical and microbiological efficacy of meropenem therapy. In post-hoc subanalyses, clinical and microbiological outcomes were evaluated in subgroups of patients with empiric and culture-based therapy, in patients without concomitant therapy potentially active against Gram-negative bacteria (GNB), in patients with APACHE II > 20 and in patients with MICs of pathogens higher or equal 1.5 mg/l. The clinically evaluable population included patients who met the protocol definition, received meropenem therapy for at least four full days and had sufficient data available to determine clinical outcome at the end of treatment (EOT). Microbiologically evaluable patients had at least one bacterial pathogen identified at baseline that was susceptible or intermediate to meropenem. Clinical response was evaluated at the end of therapy as treatment success or failure. Clinical success was defined as complete or partial resolution of leukocytosis, temperature, and clinical signs and symptoms of infection (defined as cure or improvement). Failure consisted of any of the following: persistence or progression of signs and symptoms of infection, development of new clinical findings consistent with active infection, or death from infection. The addition of an agent for Gram-positive bacteria coverage was not considered a clinical failure. When a situation was unclear, two investigators independently determined the status. If their initial assessments differed, the third independent physician arbitrated the result. A microbiologist blinded to the patient allocation assessed microbiological outcomes at the end of the meropenem therapy. The categories of eradication and presumed eradication were deemed as microbiological success. Persistence, presumed persistence and resistance were designated as microbiologic failure. For patients with multiple organisms at the same infection site, microbiologic evaluation was based on organisms susceptible to meropenem. Detection of a new pathogen from the site of infection during the meropenem therapy was evaluated as colonization if no new antibiotic therapy was indicated, or as superinfection if antibiotic therapy to target the results of the new culture was established. Patients who developed colonization were classified as microbiological successes; patients with superinfection caused by pathogens involved in therapeutic spectrum of meropenem were assessed as microbiological failures. Superinfections caused by methicillin-resistant staphylococci (MRSA), Enterococcus faecium, Candida spp. and other fungal species were not classified as microbiological failure. The decision between colonization and superinfection was accomplished according to the consultation between a microbiologist and treating clinician. The outcome categories exact definitions used are described in the additional file (Additional file 1, Table S1). Secondary outcome measures were meropenem-related length of mechanical ventilation, meropenem-related length of ICU and hospital stay (LOS), ICU and in-hospital mortality, duration of meropenem treatment, the total dose of meropenem and the safety of both dosing regimens. Meropenem-related length of mechanical ventilation was defined as the number of days of mechanical ventilation from the start of meropenem administration. Meropenem-related length of stay was defined as the number of days from the beginning of meropenem therapy to the day of discharge from ICU or from the hospital. Safety of meropenem therapy was evaluated by clinical symptoms (diarrhea, rash, vomiting and seizures) during the meropenem therapy and by assessment of laboratory parameters and their changes during meropenem therapy (transaminases, alkaline phosphatase, bilirubin, thrombocytes). Other data, such as age, weight, gender, APACHE II (Acute Physiology and Chronic Health Evaluation II) and SOFA (Sequential Organ Failure Assessment) scores at the start of meropenem therapy, diagnostic group, type and etiology of infection treated by meropenem, MICs of identified pathogens, length of ICU stay prior to meropenem administration, occurrence and length of previous antimicrobial therapy, number of antibiotics given before the start of meropenem, the rate of empiric and culture-based meropenem therapy and the rate of community and nosocomial infection were recorded. C-reactive protein (CRP), white blood cell (WBC) count, platelet count, aspartate aminotransferase (AST), alanine aminotransferase (ALT), alkaline phosphatase (ALP) and total bilirubin were examined at the start and at the end of meropenem therapy. Baseline demographic characteristics, safety and drug-related adverse events, including laboratory results, were assessed on an intention-to-treat (ITT) basis. The secondary clinical outcome measures were analyzed on both, ITT and per protocol basis. The clinical cure rate, concomitant antibiotic therapy, microbiological findings and bacteriological success rate were evaluated only in the per protocol population. Sample size calculations were based on clinical success rates in similar previous studies with continuous application of meropenem and other β-lactam antibiotics presenting clinical and microbiological outcome improvement by 12% to 39% in the population [17, 31, 32]. We calculated a study size of 95 patients in each group by postulating an improvement of clinical outcome in a continuous group by 20% for two-sided tests with type I error of 5% and power of 90%. Because of a predictable loss of 15% to 20% of patients entering the study due to violation of protocol, we proposed to increase the number of patients in each group to 120. The Kolmogorov-Smirnov test was used to check for normal distribution of data. Continuous normally distributed data were tested with paired or unpaired t test, not normally distributed data using Mann-Whitney U test and Wilcoxon signed-rank test. Categorical data were tested using chi-square and Fisher's exact test. Multiple logistic regression with backward stepwise variable selection was used to identify the variables independently associated with the clinical and microbiological outcome of meropenem therapy in the clinically and microbiologically evaluable patients. Factors with P < 0.20 according to univariate analysis were entered into the multivariate model. To evaluate model calibration, we performed the Lemeshow-Hosmer goodness-of-fit test. The predictive accuracy of the multivariate model was expressed as the area under the receiver operating characteristic (ROC) curve. Results of logistic regression are reported as odds ratios (OR) with 95% confidence intervals (CI). Unless stated otherwise, normally distributed data are presented as mean ± standard deviation, and as median (interquartile ranges) where not normally distributed. Relative risk (RR) is presented with 95% CI. A P < 0.05 was considered statistically significant for all tests. All calculations were performed with MedCalc® version 11.6.1.0. (Frank Schoonjans, MedCalc Software, Broekstraat 52, 9030 Mariakerke, Belgium). A total of 299 patients were screened for eligibility during the study period (Figure 1). Fifty-nine patients met any of the exclusion criteria, 120 patients were randomized to the Infusion group and 120 patients to the Bolus group. Fourteen patients of the Infusion group and 12 patients of the Bolus group were excluded from the per protocol evaluation because of death or other violation of protocol. Reasons for drop out in both groups were similar. One hundred and six patients in the Infusion group and 108 patients in the Bolus group were found clinically evaluable. Because of the failure to identify causative pathogen (negative cultures from the presumed site of infection) in 10 patients from the Infusion and in 6 patients from the Bolus group, only 96 patients in the Infusion group and 102 patients in the Bolus group were selected for microbiological evaluation (Figure 1). Using ITT analysis both groups were well matched for demographics and baseline characteristics. No significant differences in severity of illness (APACHE II and SOFA scores), in the type of infection and other evaluated parameters were observed (Table 1), except for the trend to a lower number of surgical patients (n = 18, (15.0%) vs. n = 30, (25.0%); P = 0.075), and longer length of ICU stay before the start of meropenem therapy in the Infusion group (9.0 (5.0 to 16.0) days vs. 7.0 (3.0 to 11.0) days; P = 0.036). Values are presented as absolute (percentage) or mean ± standard deviation or median (interquartile range). APACHE II, Acute Physiology and Chronic Health Evaluation II; ATB, antibiotic; CRP, C-reactive protein; GFR, Glomerular filtration rate; GNB, Gram-negative bacteria; ICU, intensive care unit; MDRD, Modification of Diet in Renal Disease; SOFA, Sequential Organ Failure Assessment. The type, the rate and MICs of isolated pathogens in clinically evaluable patients were similar (Table 2). The dominant isolated pathogen in both groups was Klebsiella spp. (59.4% vs. 46.3%; P = 0.057). Values are presented as absolute (percentage) or median (interquartile range). Concomitant antibiotic therapy was used in more than 50% of clinically evaluable patients in the Infusion and Bolus groups. There were no differences in the rate of combined antimicrobial therapy and in the type of concomitant antibiotics (Table 3). The group of penicillins involved oxacillin, ampicillin and piperacillin/tazobactam, aminoglycosides comprised gentamicin and amikacin, fluorochinolons included ciprofloxacin and levofloxacin and the antifungal drugs were represented by fluconazol, voriconazole and amphotericin b. The concomitant antibiotic therapy potentially active against GNB was given in 11 patients in the Infusion group (3 - piperacillin/tazobactam + gentamicin, 1 - piperacillin/tazobactam, 1 - amikacin, 5 - ciprofloxacin, 1- levofloxacin) and in 6 patients in the bolus group (2-piperacillin/tazobactam, 1 - gentamicin and 3 - ciprofloxacin; P = 0.314). Values are presented as absolute (percentage). Linezolid or vancomycin for MRSA infection was indicated in the Infusion group in seven patients (two abdominal, three respiratory and two blood stream infection) and in five patients (two abdominal, one respiratory and two blood stream infection) in the Bolus group (P = 0,768). Rate and indication of antimycotic therapy in both groups was similar. Etiology of Candida s pp. infection in the Infusion group was proven in 33 patients (16 abdominal, 13 respiratory and 4 urine infections) and in 30 patients (17 abdominal, 11 respiratory, 1 bloodstream and 1 urine infection) in the Bolus group (P = 0.654). Aspergillus spp. etiology of respiratory infection was confirmed in one patient in the Infusion group. The rate of clinical cure and improvement in clinically evaluable patients at EOT (Table 4) was comparable between the treatment groups (88 patients (83.0%) in the Infusion group vs. 81 (75.0%) patients in the Bolus group; P = 0.180; RR = 1.1069; 95% CI = 0.9634 to 1.2718). We did not observe any difference in other evaluated subgroups of patients except for patients with culture-based therapy, in which we found the trend for better clinical outcome in the Infusion group (86.0%) against the Bolus group (74.3%); (P = 0,051; RR = 1.1581; 95% CI = 1.007 to 1.3314). In patients with intraabdominal infections a trend towards higher clinical success rate was observed in the Infusion group (15 patients (83.3%) vs. 15 (55.6%); P = 0.063; RR = 1.500; 95% CI = 1.010 to 2.228) (Table 4). Shorter meropenem-related ICU stay was detected in both ITT and in the clinically evaluable population in the Infusion compared to the Bolus group (10 (7 to 14) days vs. 12 (7 to 19) days; P = 0.044) and (10 (7 to 16.5) days vs. 13 (8 to 21) days; P = 0.042), respectively (Table 5), but no difference was found in subgroups of patients with APACHE II > 20 and patients with MICs of pathogen ≥ 1.5 mg/l (Additional file 2, Table S2). The shorter duration of meropenem therapy (7 (6 to 8) days vs. 8 (7 to 10) days; P = 0.035) and lower total dose of meropenem (24 (24 to 32) grams vs. 48 (42 to 60) grams; P < 0.0001) were observed in the Infusion group (Table 5). The CRP concentration at the end of meropenem therapy evaluated in post-hoc analysis was higher in the Bolus group in overall clinically evaluable patients (59 (32 to 87) mg/l vs. 72 (37 to 114) mg/l; P = 0.037) and in the subgroup of patients with APACHE II > 20 (62 (32 to 87) mg/l vs. 78 (42 to 126) mg/l; P = 0,036) (Additional file 2, Table S2). Clinical cure rates in clinically evaluable patients at the end of treatment. Microbiological success rate (assessed in microbiologically evaluable patients only) was higher in the Infusion group (87 patients with overall pathogen eradication (90.6%) vs. 80 (78.4%); P = 0.020; RR = 1.156; 95% CI = 1.024 to 1.303). In the subanalyses we detected similar results in subgroups of patients with culture-based therapy and in patients without concomitant antibiotic therapy potentially active against GNB (Table 6.). In single pathogens, we observed a trend to better efficacy of infusion of meropenem in infections with Klebsiella spp. etiology (58 eradications (92.1%) vs. 39 (78.0%); P = 0.055; RR = 1.180; 95% CI = 1.002 to 1.391) (Table 6). Similar results in the rate of overall persistence and resistance were found with no differences in single pathogens (Table 6). The rate of colonization and superinfection during meropenem therapy did not differ (Additional file 3, Table S3). None of the isolates of meropenem therapeutic spectrum cultured from the site of infection during meropenem therapy required the initiation of new antibiotic therapy at EOT and all of these findings were classified as colonization. Superinfections with fungal species etiology necessitated antimycotic therapy but according to protocol were not evaluated as microbiological failure. In multivariate logistic analysis, the number of antibiotics given before the start of meropenem (OR = 0.478; 95% CI = 0.323 to 0,706; P = 0.0002) and the age (OR = 0.947; 95% CI = 0.917 to 0.973; P = 0.0001) were negatively associated with clinical success of meropenem therapy. Continuous administration of meropenem was independently related to the microbiological success (OR = 2.977; 95% CI = 1.050 to 8.443; P = 0.040). Predictors of microbiological failure were the abdominal infection (OR = 0.249; 95% CI = 0.092 to 0,674; P = 0.006) and the number of antibiotics given before the start of meropenem (OR = 0.581; 95% CI = 0.383 to 0.881; P = 0.011). The performance of the final multivariate logistic models for clinical and microbiological outcome was good (Lemeshow-Hosmer goodness-of fit test for clinical and microbiological outcome with P = 0.63 and P = 0.53, respectively), and discriminated reasonably well between success and failure of meropenem therapy. The area under the ROC curve for clinical and microbiological outcome was 0.80, and 0.78, correctly predicting clinical and microbiological outcome (82.97% and 85.3%, respectively). Possible meropenem-related clinical adverse events were rare and the rate in both groups did not differ (Additional file 4, Table S4). In laboratory parameters related to the safety of meropenem, we observed no difference between groups, although there was considerable increase in concentration of ALP at EOT in both groups against the baseline. The platelet count rose in the Bolus group significantly (Additional file 5, Table S5). In our study, continuous infusion of four grams of meropenem per day preserved a similar rate of clinical cure, but reached a higher antimicrobial efficacy compared to intermittent bolus administration of six grams of meropenem divided in three doses. Multiple logistic regression identified the infusion of meropenem as an independent predictor of microbiological success. As far as we know, our study provides the largest patient-data pool concerning the issue of dosing regimens of meropenem and their microbiological and clinical efficacy in the critically ill. Kojika et al. , compared prolonged and bolus administration of meropenem in 10 patients with abdominal sepsis (5 in each group). Apart from early improvement of systemic inflammatory reactive syndrome (SIRS) score, no changes in body temperature, white blood cell count and serum CRP were demonstrated. In a retrospective cohort study in patients with ventilator associated pneumonia (VAP), Lorente et al. observed significant clinical improvement in the infusion group (90.5% vs. 59.6%; P < 0.001). Intermittent application of 1 g of meropenem every six hours in this study might not reach required effective T > MIC and contribute to worse clinical outcome. Nicasio et al. in a prospective, observational evaluation with a historical control group in patients with VAP presented reduced infection-related mortality (8.5% vs. 21.6%; P = 0.029), infection-related length of stay (11.7 ± 8.1 vs 26.1 ± 18.5; P = 0.001), and fewer events of superinfection (16% vs. 35.1%; P = 0.007) in patients treated by administration of three-hour infusions of cefepime 2 g every eight hours or meropenem 2 g every eight hours plus tobramycin and vancomycin. The retrospective and/or historical control design of these encouraging studies strongly affects their power. Alas, our study failed to prove the primary outcome hypothesis of better clinical cure in the Infusion group (83% vs. 75%; P = 0.180). We have observed only a trend towards better clinical outcome in patients with abdominal infection (83.3% vs. 55.6%; P = 0.063). Some factors could contribute to these negative results. First, our sample size calculation was based on previously published results (Grant 2002, Lorente 2007), but these seem to be overly optimistic. Second, more than half of evaluated groups comprised post-surgery or trauma patients and other factors could play a role in their outcome. Nevertheless, the major cause of the failure to prove better clinical outcome in the Infusion group consists probably in the disproportion of daily cumulative dose of meropenem between groups (four grams in the Infusion and six grams in the Bolus group) and little difference between both types of meropenem administration in achieving T > MIC in relatively susceptible pathogens. We calculated the dose of meropenem (2 g every eight hours) in the Bolus group according to the suggestion for achievement antibiotic's optimal PTA (probability of target attainment) and CFR (cumulative fraction of response) in critically ill patients with serious infections [10, 35–39], but the MICs in greater part of isolated pathogens (84.3%) were very low, which prolonged the effective time in the intermittent dosing regimen. Only in 15.7% of pathogens (Acinetobacter spp., Pseudomonas aeruginosa and Stenotrophomonas maltophilia) were MICs higher (2.000 (1.500 to 2.000) mg/l) (Table 2). Although there was no difference in overall clinical outcome, some laboratory markers of infection stress could indicate better efficacy of continuous treatment. Despite similar values of WBC and CRP at the start of therapy, the CRP levels at EOT were lower in the Infusion group (P = 0.037) (Additional file 2, Table S2). Notwithstanding the same clinical outcome, we observed the trend towards shorter meropenem-related length of mechanical ventilation and significant shorter meropenem-related length of ICU stay in the Infusion group (Table 5). Similar results in comparable β-lactams studies demonstrated Nicasio et al. 2010 (shorter infection-related stay), Lodise et al. 2007 and Merchant et al. 2008 (both shorter hospital stay) [34, 40, 41]. We did not find a difference in hospital LOS; however, the results in both groups were confounded by prolonged hospitalization of several patients with severe critical illness polyneuromyopathy and other complications in consequence of severe multiple organ failure. Hospital and ICU mortality in the Infusion group in ITT and in the clinically evaluable population was somewhat lower but not significantly, contrary to results of some nonrandomized studies [34, 40, 42]. Continuous administration of meropenem was associated with improvement of bacteriological efficacy documented as higher eradication rate and lower bacterial persistence (Table 6). A possible explanation for better microbial clearance in the infusion group could be the maldistribution of blood flow in the microcirculation in critically ill patients. Continuous application of meropenem can probably maintain higher concentrations of meropenem in the tissues than intermittent bolus dosing . To date, no study comparing microbiological outcome of both dosing regimens of meropenem has been published. Two studies showed an improved bacteriological efficacy of continuous application of beta-lactams (ceftriaxone  and piperacillin/tazobactam , but also conflicting results were published [45–47]. No difference between both groups was observed in the rate of resistance, colonization and superinfection in our study (Additional file 3, Table S3). The occurrence of resistance in infusion and bolus group was low (2.1% vs. 3.9%) and developed in typical pathogens with lower susceptibility to meropenem (Acinetobacter spp., Pseudomonas aeruginosa, Stenotrophomonas maltophilia) (Table 6). The representation of antibiotics given as concomitant therapy in both groups was similar. The high rate of concomitant antifungal drugs (32.1% in the Infusion and 27.6% in the Bolus group) was undoubtedly associated with previous antibiotic therapy (95% in the Infusion and 94.2% in the Bolus group) and related to preceding ICU stay prior to meropenem therapy was commenced. The most commonly reported drug-related adverse events in patients treated with meropenem include diarrhea, rash, seizures and/or nausea and vomiting [29, 48]. We did not evaluate the nausea, because all randomized patients in our study were sedated and mechanically ventilated. Meropenem administration was generally well tolerated and the incidence and types of adverse events possibly related to meropenem were similar in both treatment groups (Additional file 4, Table S4). The overall rate of adverse events was not frequent (9.2%), their relevance was relatively low and in none of the patients was meropenem therapy interrupted due to adverse effects. The most frequent events were diarrhea and vomiting (4.2% in the Infusion group vs. 5.8% in the Bolus group and 1.7% vs. 2.5%, respectively); however, the association with meropenem administration was dubious and all events occurred in the period of conversion from parenteral to enteral nutrition. None of the diarrhea events was associated with Clostridium difficile infection. The only case of seizures was observed in a patient with traumatic brain injury and ceased immediately after anticonvulsive therapy was established. None of the four episodes of rash were clinically significant and resolved spontaneously. Increased levels of ALT, AST, ALP, bilirubin and thrombocytosis are the most frequently reported laboratory adverse events related to meropenem administration [29, 48]. We have observed a significant increase of platelet count in the Bolus group and the rise of ALP in both groups (Additional file 5, Table S5). We found no intergroup difference and no therapeutic measures were necessary. The tolerability profile of meropenem is well established, and the safety of the drug has been extensively reviewed [48, 49]; however, to our knowledge, no studies have formally examined and compared adverse effects of continuous or bolus regimens of meropenem. Our study has several limitations that should be taken into account when interpreting the results. It was not blinded, and was conducted in only one center. The influence of bias in clinical evaluation, despite the third person being involved in case of ambiguity, is indisputable. On the contrary, knowing about this risk of bias, the evaluation of clinical success in the Infusion group could be more strict and censorious. This could explain the discrepancy between insignificant clinical and positive bacteriological results, especially in view of the fact that a microbiologist blinded to the patients' allocation group performed microbiological assessment. Another limitation is frequent concomitant antibiotic therapy (48.1% in the Infusion and 50.9% in the Bolus group) reducing the validity of conclusions about the only impact of meropenem. The dose of meropenem in the Bolus group (6 g/24 hrs) might be potentially confounding, despite that it was used in accordance with the recommendations for the critically ill patients [10, 35–39]. Using this dose, the concentration of meropenem could reach T > MIC for 100% of dosing interval in the susceptible pathogens with relatively low MIC. This may potentially favor the Bolus group patients and mask the pharmacodynamic benefit of a continuous regimen. In view of this fact, we recommend for the next studies the use of the same dose of meropenem in both arms adjusted according to the detected MIC. We did not monitor time between the onset of sepsis and administration of antibiotic therapy, which is an important variable correlating with the outcome. Nevertheless, the patients of both groups were treated by the stable team in one ICU, so we could presume that there were no substantial differences between both groups in periods between the onset of sepsis and the start of therapy. We observed shorter meropenem-related ICU LOS in infusion group; however, the ICU discharge criteria were not predefined, which further limits interpretation of our results. Continuous infusion of meropenem is safe in comparison with a higher bolus dose, provides equal clinical outcome, generates superior bacteriological efficacy and offers the encouraging alternative of antimicrobial therapy in critically ill patients. Continuous administration of meropenem was independently associated with favorable microbiological outcome, was connected with shorter length of ICU stay and with fewer days of meropenem therapy. The reason for failure to demonstrate better clinical cure in the infusion group in spite of the advantageous pharmacodynamic attributes we see in little difference between both types of meropenem administration in achieving T > MIC in relatively susceptible pathogens. The efficacy of continuous or prolonged infusion of meropenem should be investigated in randomized, controlled trials with equal daily doses in both regimens and in populations suffering from infections caused by multi-drug resistant GNB with elevated MICs. Continuous infusion of meropenem is safe, in comparison with higher bolus dose, provides equal clinical outcome, generates superior bacteriological efficacy and offers encouraging alternatives of antimicrobial therapy in critically ill patients. In this study, continuous administration of meropenem was identified as an independent predictor of microbiological success and was associated with shorter length of ICU stay and with fewer days of meropenem therapy. The study was supported by a research grant from Czech Ministry of Education MSM0021620819. IC was responsible for the study design. MS, PP, AZ, JB, RP and EK were responsible for administering the protocol. IC, MS and JB provided the data analysis and drafted the manuscript. All authors have given final approval of this version of the manuscript.